Its been a while but here’s my first postcard of 2012, and what a great one it is.  Biennially, two weeks before the F1 teams arrive in the Principality, the Automobile Club du Monaco stages the Grand Prix Historique…. undoubtedly one of the most prestigious historic events in the European calendar. Such has become the popularity and accessibility of this event, that for the 8th Historique, free practice and qualifying took place on both Friday and Saturday, with racing on Sunday.. supported by four auctions, in three locations, on two days. Friday dawned warm and sunny, with a visit to the paddock, and the Alpine chalet inspired Credit Suisse Drivers Club, for their inaugural drivers forum. Chaired by Simon Taylor of “Motor Sport” magazine, the panel were ex F1 racers Jochen Mass and Emmanuele Pirro, ‘70’s F1 entrant and broadcaster Alain de Cadenet and the Historique’s most successful competitor, Duncan Dayton. The sixty minute discussion, explored the passion and competitive element of historic motorsport, alongside the differing approach, prevalent within F1, fifty years ago…. most humorous panellist was five time Le Mans winner, and Audi ambassador Pirro, who combines his passion for the past, with his part-time role, as a current FIA Grand Prix driver steward. 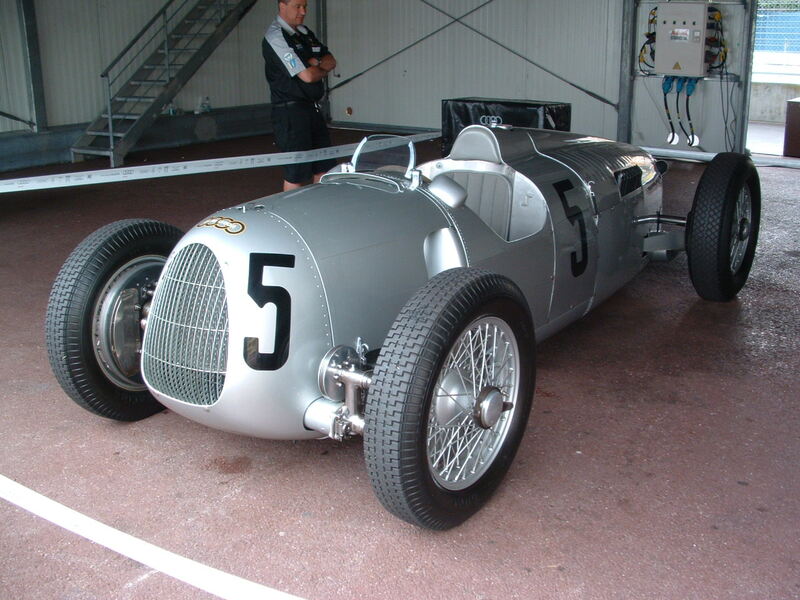 As in previous editions of the event, headline sponsor Chopard, in partnership with Audi Tradition, provided a 1936 Auto Union C Type (above) for lunchtime demonstrations, by six time Le Mans winner Jacky Ickx. The shrill of the V16 520bhp supercharged engine created much attention, and I can only imagine what the noise was like in Monte Carlo seventy two years ago, when Achille Varzi and Hans Stuck finished 2nd and 3rd in the same type of car, to Rudolf Caracciola’s winning Mercedes. Julian Bronson (ERA R4D) and Paddins Dowling (ERA R10B) enjoyed a race-long “dice” in Serie A, with the former winning by just 0.7 secs, whilst sometime DTM racer and historic regular, Frank Stippler, demonstrated superb car control in Willi Balz’s Maserati 8CM, to finish fifth. 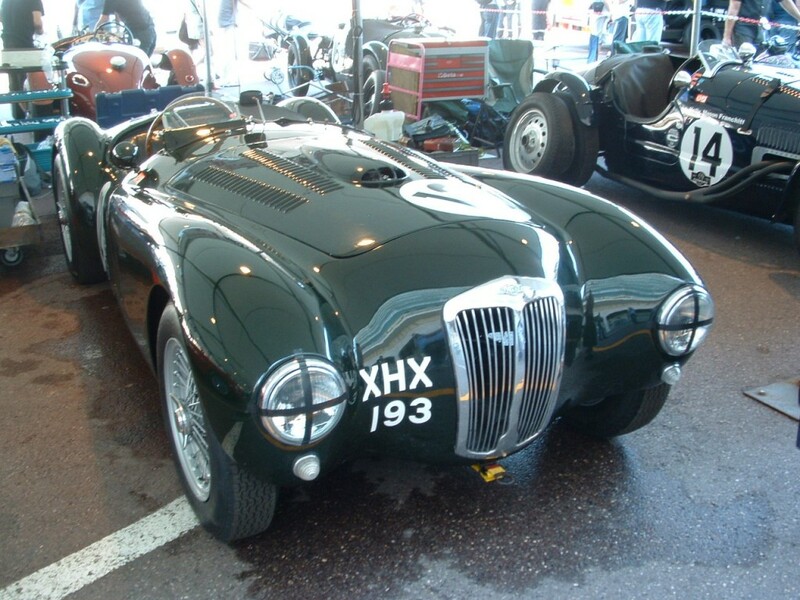 Alex Buncombe (son of ‘70’s saloon and GT racer Jonathan) drove a peerless race in Derek Hood’s Jaguar “C-type” to secure Serie C, for pre-’52 sports-cars. Kiwi Roger Wills, had a comfortable victory in Serie B in his Cooper T51, after Duncan Dayton spun, exiting Ste Devote. Click these links for Race results and trackside galleries. Chronologically, RM Auctions Europe, started the weekend – presenting the Carlo Saltarelli Ducati collection on Friday at 1pm, in the spacious, seawater air-conditioned, Grimaldi Forum. All lots sold, with the ex- Casey Stoner 2010 Phillip Island winning Moto GP Ducati Desmosedici, the most expensive at €251.5k. Situated in the predominantly residential community of Fontvielle,, the Le SAS Prince du Monaco car collection once again hosted Bonhams, where they had consigned ninety-one lots of automobilia, eighty cars and forty-four Heuer watches. Well attended, all five Ferrari tipo’s on offer sold, with top sale, a UK-trade consigned 250 GTO replica (€281.7k), alongside an immaculate 1962 Facel Vega II (€253k)…..but these were the high points, of what must have been a very disappointing sale. On the Saturday, London based auctioneer Coys occupied the close by Espace Fontvielle (an all-purpose exhibition venue, home to the Monaco circus), offering a diverse catalogue, in a modestly attended, somewhat gloomy, poorly ventilated environment. Of the ten Ferrari tipo’s offered, six sold, with top sale, a well presented, 1971 Dino GT (€154.1k). Catching my eye was a very well restored 1957 Lancia Aurelia B24 Convertible (€197k) and a marque specialist maintained, 1954 Mercedes 300SL Gullwing (€674.7k), whilst the “star” lot was a 1936 Rolls Royce Phantom III 3 position drophead, which doubled its estimate, realising €1.14 million. Despite a sell through rate of 48%, the sale total was a healthy €4.7 million. After a dash in balmy sunshine, to the opposite end of the Principality, RM Auctions Europe () offered a broad spectrum of collector cars, from a 1993 Cagiva Moke, realising €19k, to the “star” lot, a 1957 Ferrari 625TRC Spider (€5.04million). 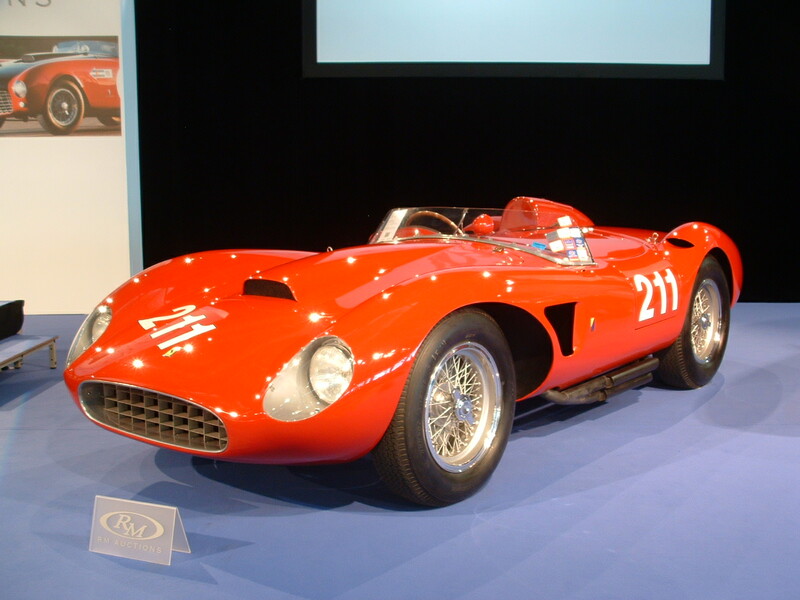 Of the twenty three Ferrari tipo’s consigned, nineteen sold, alongside the Ferrari powered Arno XI hydroplane (€868k). Very determined bidding was required to secure both the highly original, Autodelta built, 1969 Alfa Romeo T33 sports-racer (€1.23 million), (which exceeded its reserve by €400K), and the one owner for forty two years, 1966 Ferrari Dino 206S (€2.5 million). Looking good value were three Lancia’s – a late production, 1949 Aprillia (€31.3K), a well-presented, UK consigned, 1954 Aurelia B20 (€78.8K) and a low mileage example of the very rare, 1995 Hyena (€89.6K). With a packed auditorium, the five hour sale generated €33.5 million, a sell through rate of 86%, and three new world records. The 8th Monaco Grand Prix Historique was superbly organised, with excellent racing and much to see off-track in the sparkling Cote D’Azur sunshine…roll on 2014! To see a selection of my best photos from the weekend click here. On returning to the UK, came the sad news of the passing of both 1959 Le Mans winner and constructor of the legendary AC Cobra, Texan Carroll Shelby, and fellow BRDC member and Aston Martin team-mate, race-wear manufacturer Les Leston. Both have left an indelible mark on the history of motorsport, my condolences to the family’s of both. With the very recent completion of the 2012 Mille Miglia retrospective, and the forthcoming Villa D’Este Concorso, the European collectors car calendar is in top gear…..next stop for me is close to home and the fifth Cholmondeley Pageant of Power ….see you there! The 2018 Audi PB18 e-tron Concept. How cool is this?